Home » Blog » News » I,Q Two Final #45. 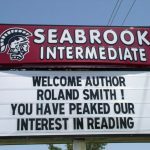 Seabrook Intermediate. Texas. I,Q Two Final #45. Seabrook Intermediate. Texas. Up early writing… Flying home after speaking at Seabrook Intermediate, which was great fun. Thanks to all the librarian and students in the Houston area! Texas to Oregon is not that long of a flight, but for some reason it’s taking a long time to get there. By the time I get home it will be one of those 20 hour speaking/travel days. Marie is flying east to DC today to sign her new book “S is for Smithsonian” at 4 museums Saturday and Sunday. I’ll try to get her schedule and post it. If any of you are on the Mall this weekend drop by and say hello to her. ← I,Q Two Final #44. League City Intermediate & Ferguson Elementary. Gary Brown. Texas.